Where can I harvest energy in my home to power my wireless sensors? I was reading this article, "Five Building Blocks of Self-Powered Wireless Sensor Nodes" (shared on Meta) about energy harvesting in IoT. I am planning to implement some prototype, harvesting devices to explore the possibilities. To get some experimental data about how much energy can be harvested in my home. Currently I am trying to identify the possible spots in my home where these energy harvesters could be placed and efficiently used. Maybe a vibration energy harvester could be attached to the washing machine in the bathroom. Risky environment as the humidity can be quite high so appropriate protection is needed. Thermal energy harvester could be placed near the oven in the kitchen. Thermal energy harvesters could be placed near the heating elements in the bedrooms. What other parts of the apartment should I place further harvesters for experimenting? So for example can a microwave oven be a possible source or other frequently used kitchen appliances? I have an electric boiler above my bathroom (inside the apartment), so maybe the hot water pipes running down to the bathroom are good sources as well. What else could be there? Are there any more possibilities to harvest vibration energy in a home? I don't know if it is in the scope of your question but you can't imagine the wasted energy of opening/closing a door! EDIT, thanks to to Olivier Dulac's comment I was able to find the strip without having to read all my Gaston collection! Translation if from me but I can't translate the last picture, it's a French pun on words about a unhinging ourselves when we are mad. Footsteps? Harvesting vibration with a plaque where people walk the most : entrance, where you put your coats, near a Kinect playfield. Computers, servers: harvest their heat. Make a outdoor boiler using hot water roof panels (of course you need your landlord's agreement) and harvest the heat. Solar energy is even indoors an alternative to thermal and vibrational energy harvesting. This indoor photovoltaics use both the natural light and artificial light. On the Feasibility of Indoor Light Energy Harvesting for Wireless Sensor Networks (Carlos Carvalho and Nuno Paulino) discusses indoor light energy harvesting of the attenuated natural illumination. 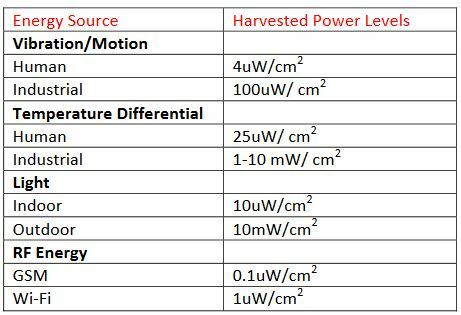 The authors describe the powering of a low power wireless sensor node with an average power level of 11.51 µW. This low average power level is achieved by a very low duty-cycle of the system making one transmission every hour only. Clearly the use of ambient light in an indoor setting yields a lower return than other sources, still it could work out for certain use cases. While having so much valuable answers to my question I have also done some further research about the topic. I have found an additional harvesting solution and also a great reference design about a wireless, solar energy powered sensor node, without using a battery. First the additional method from Texas Instruments, which is called RF switch harvesting technique. (The video is worth watching, the RF switch part starts at 2:29.) It is based on a magnetic switch which structure can be seen on the image below. On the drawing here in the red is the switch part the user will push. We have a magnet inside with the two poles. And this is creating a magnet field through this core back to the other pole. When the user flips the switch, you can see the field changes. It goes the opposite direction through the core. And we know from Maxwell's equations that this change in magnetic field through these windings will produce a current. This is energy that we can harvest and make use of. The switch produces an AC current that needs to be converted to DC current which can charge a capacitor. Then the energy stored in the capacitor can be used to power a low-power wireless MCU. TI has actually realized this and they were able to supply enough energy for 21 milliseconds for the wireless MCU. The reference design is a Solar Dice which can wirelessly transmit an accelerometer's data to a smartphone. The solution does not use a battery and quite compact. Worth reading or browsing the provided test data, schematics and other documents. It seems like it should be possible to have a small device that you simply wrap a mains power cord around a few times (or wrap the device around the power cord, I'm not sure which). When the "host" device is powered on and current is flowing, the "parasite" on the power cord would become powered--not much, obviously. But, perhaps enough to periodically send a wireless "ping" with an ID (like a MAC address) to some receiver. What this would get you is a sensor that would tell you whenever "dumb" devices were switched on. Based on the frequency of the pings, you might even be able to infer how much power the dumb device was using. Since the mechanism would be simple and inexpensive, and require no regulatory approval for plugging into mains power (UL/CE etc.) possibly someone could sell these in packs for a target price of ~$5 each. When you get enough of them (which would be the point to have a lot), a machine learning system could learn things about your habits: The hair dryer is on, it's probably ~30 minutes to bedtime. The coffee machine is on, turn on the radio...that sort of thing. And you don't have to buy a smart hair dryer or coffee machine that costs 30-40 times as much as a $5 sensor just to get that usage data. Radiators should be a source of vibration (driven from the pump), though you would probably need to investigate the resonance frequencies quite carefully. It is also possible to embed kinetic energy harvesting in switches, although that may not be quite the use case you're imagining. The other side of the equation is determining how much energy you require for a transmission, which will give you some information about how frequently it is possible to transmit, together with your leakage/standby drain. This is a great idea to harvest energy from our daily energy use. But you have to consider that the energy you harvest comes from somewhere. If you want to harvest some heat from your room heating elements, you must be aware that all the heat converted to electricity via your device will not heat the room. So, your room heater will have to consume more electricity if you want to keep your room as comfy as it used to be before you set up your heat harvester. Take heat from devices where heat is wasted (i.e. any object whose main role is not to heat, like computers of servers as said above) seems to be more in the spirit of what you want to achieve. 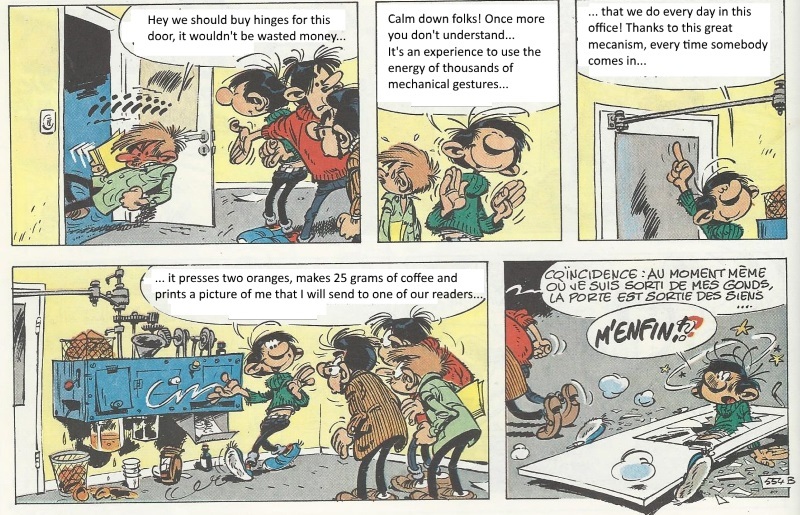 In a Gaston-Lagaffe-style, you can set up small devices on doors, stairs etc...to create energy every time you pass by. An idea among others, you can set up a small dynamo at the top of your stairs, and every time you go down you grab a nylon-cord and run the dynamo. Once downstair, you let go the cord and it rewinds. The nylon cord will run for about 20m if your stairs are 10m long, so with a good gear ratio and efficient dynamo you can generate the amount of power you need for any small device around. Forget about stealing your neighbor's Wi-Fi to surf the internet. Using cheap everyday materials, researchers at Duke University’s Pratt School of Engineering have developed a remarkable device that can convert microwave signals, like those used to wirelessly transmit the internet, into usable electricity. So in the future, you might instead be able to use your neighbor's Wi-Fi network to power your home. EM Fields from AC wires behind wall (if mounted near an electrical wire). Abstract - There has been considerable interest in energy harvesting for wireless sensor networks. Energy harvesting from thermal sources such as body heat and mechanical sources such as human motion have been proposed. There are also sensor network systems that harvest energy from the visible part of the electromagnetic spectrum. However, ambient light levels in indoor environments are typically significantly lower than those found outdoors and highly dependent on the nature of the indoor environment considered. Recently, lowpower clock synchronization using electromagnetic energy radiating from AC power lines was proposed. In this paper, we go a step ahead and try to answer the question: Can energy be harvested from the electromagnetic energy radiating from AC power lines and use it to operate a wireless sensor network with a low duty-cycle? We find that such energy harvesting appears promising. An exercise bike/ treadmill rigged to a dynamo. This will also give you an incentive to work out. Rather than using the microwave oven/convection oven which will eat into their function, you can place a small chimney over the cooking place (though the escaping vapors might pose a problem). I don't exactly know how, but people sit on the couch all day. I know that it's potential energy, but something could be achieved there. The door idea from the above answers is great. Tiny wind mills in the patio. Solar cells (available on the cheap now) can be used outside. the difference between internal house temperature, and external. With a temperature controlled living environment, there would often be a non-trivial differential, one way or the other. Even without that, external temperature often changes through 24 hrs, whereas we try to keep internal temperatures constant - So much of the day there still might be a differential. I know the differential is minor, - But the point is - It's there for a lot of the time. A huge advantage of this, it would seem to me, for iOT sensors, is that the energy source is available at much of the periphery of the living space - Ceiling, windows, walls, floor (perhaps). I haven't done any calculations to figure out whether you could harvest enough energy... But obviously - Depends how much you need. One upside is that being such a passive device, and planar in shape, you could probably design something fairly large, say, 6 inches square? but still aesthetically pleasing for ceiling or wall mounting. One downside is that you may get days in a row where there isn't much differential - If the external temperature hovers around a comfortable room temperature. ADDENDUM: Yes, I know this isn't free energy, but the OP didn't explicitly ask for that. A common problem with IoT devices is running wires everywhere. Perhaps the OP, at least partially, just wants to avoid that? The average human produces 100 watts of power at rest. That's enough to power about 6 laptops (assuming the estimate of 15 W for a low-end laptop) if you can convert 100% of the power you produce into electricity. Of course, we can't defeat the laws of physics, and inevitably you can't convert 100% of your energy into electricity; after all, you need energy for your metabolism and bodily functions. There are startups creating felt that generates power from your body heat (approximately 1 or 2 watts can be generated from that). Alternatively, you could use an exercise bike to generate electricity, as shown in this really nice infographic by the IEEE. This method relies on you being inside (and some methods rely on you actually being present to operate the crank/pedal/dynamo), so it's not entirely foolproof. You mention generating electricity from heat. All devices that turn thermal energy into work have a hot side and a cool side. The theoretical maximum energy available from the heat comes from the difference between those temperatures. This means that cold things are just as good for generating energy as hot things are--but you'll do even better if you can get a hot thing very close to a cold thing and put a thermoelectric generator in between. You also want to be careful not to harvest energy that you're paying to create. You could get some energy between hot water pipes and cold water pipes--but then you're just making your water heater work harder--might as well just use mains power and pay for it directly. On the other hand, if you exploit the energy differential between a wastewater pipe (suppose somebody's taking a hot shower or draining pasta) and a cold pipe, then your cold water gets slightly warmer, and your wastewater gets slightly cooler--neither of these are likely to be a problem (unless the specific cold pipe you're using feeds into your refrigerator). This is a particularly northern answer, but if you have a metal roof with a fairly steep slope, and you get a decent amount of snow in the year, there is quite a bit of energy being wasted when it comes sliding off. Alternatively, for people who get less snow in the year, the rainwater that comes off the roof is a good place to harvest energy. An electric dynamo could be hooked up to your gutters, producing energy any time it rains. Potentially, you could even have sensors in the gutters to adjust the dynamo generation capacity based on the quantity of water flowing through. There is about 48V available on any land line in your house. Lots of bad articles on the internet about this, though this seems to be the best I've seen. Many kitchen and other household appliances have significant vibrations as well. Think dishwasher & microwave in the kitchen. Clothes washer & driers. Any bit of electronics with a motor (cooling fans? turntables?) likely has a notable vibration output. Thermal energy captured by thermoelectric Peltier elements. Thermoelectric elements are non-expensive and available in Europe, on Alibaba.COM and Amazon.COM. Please note that back in 1930 thermoelectric elements were used in radios in USSR in tundras harvesting energy from carbide lamps. Solar energy has nowadays very sophisticated and cool products. For example something like SolarWindow can be a motivator to use it. Piezoelectric (discovered in 1880 by Pierre Curie and his brother) polymers are really fascinating materials. For several years my team is playing with such material PolyPower introduced by Denmark company Danfoss. A slightly obscure answer is 'from the sensor'. By making the hardware event driven you can potentially improve the standby power by such a large magnitude that a battery can be regarded as a non-replaceable part of your hardware. See this research from the University of Bristol where they have optimised a switching element for pA leakage. Although I've seen this in passing before, I didn't appreciate the practical value till watching a video which described the scope for using the device. Not the answer you're looking for? Browse other questions tagged smart-home sensors power-consumption sustainability or ask your own question. How do I avoid port forwarding when exposing IoT devices to the external Internet? Which UK smart energy meters can be used as IoT sensors? Where can I buy “all-in-one” sensors? How relevant is the energy consumption of IoT and RF home devices?